One of the UK’s Olympic greats is ensuring the 2012 legacy for young people will consist of more than stadia and facilities in London. David Hemery talks to John Holt about his challenge to capture young hearts and minds by providing the ultimate ‘win-learn situation’. 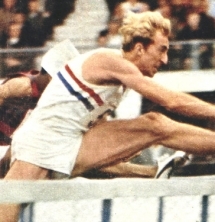 David Hemery CBE – Olympic champion and world record breaker, multi-medal holder and much-decorated motivator and mentor – exudes get up and go from every pore. So when fellow high-achiever Seb Coe needed someone to hit the ground running for a London 2012 legacy p project specififically aimed at developing and inspiring young hearts and minds across the country, he knew where to turn. Readily accepting the challenge, David, best known for his breathtaking 400m hurdles win as a 24-year-old at the 1968 Mexico Olympics, soon faced his first major obstacle. From the overall £9.3 billion budget, his project was to receive...precisely nothing. “This is not just about sport; we are stimulating them into living their dreams whether they want to be vets, magicians or pilots,” he says. The project arranges professional development sessions to fully prepare teachers to make the most of an inspirational visit from leading sports personalities such as javelin champion Steve Backley, sprinter Darren Campbell and rower Katherine Grainger. The ranks of the great and good also include people such as Danny Crates, a former rugby player who – after losing an arm in a car crash – became a successful runner. “In his session, Danny talks about the depression, anger and loss he suffered and how he eventually got a grip on his life. He then describes how his success, like any other successful person, is down to hard work and receiving positive support. “For a young person, that support may be as simple as knowing who to ask for help and advice,” adds David, who has himself been inspired by what he has seen and heard in the classroom. “At one session, one young girl said her goal had been to teach her deaf brother how to handle his anger. He signed at home but became very violent outdoors because he couldn’t communicate properly. He uses his own background as source material when he talks in schools. “When I was 14 years and three months old, I was five feet three inches tall and weighed around six stones. That was shrimp-like. They didn’t diagnose dyslexia in my era and I didn’t learn to read until I was 10. “If at that time someone had said to my teachers this guy will get four degrees and write three books they would have laughed and I would have panicked. “There is so much untapped potential in everyone. How many of us were told we were good at something when we were young? We are poor at that. Unlike many of today’s athletes who simply have to concentrate on their sport, David combined his training with studies for a business administration degree at Boston University in the US. “You just have to be well-organised,” he says. “While it was pretty shattering, I think it was an advantage as I believe that if you focus only on sport in terms of self-improvement, something as small as a slightly in-growing toenail can become a major problem. That meant that David was able to complete a teacher training course before the 1970 Commonwealth Games (where he was British team captain and 110m hurdles champion) and his master’s at Harvard in the run-up to the 1972 Munich Games (bronze in his event, silver in the relay). In 1976, he returned to Boston University where he spent seven years coaching the athletics team, teaching and studying part-time for his doctorate in humanistic education/social psychology. During the summers, he competed in the BBC’s Superstars series which put a variety of sports personalities through a rigorous series of tests and events. He won three times despite the best attempts of some competitors to gain a naughty advantage. “Some of them actually dropped out of their sports altogether to concentrate on the programme which kind of lost the essence of what it was about,” he says with a smile. With a foot in both the education and athletics camps, school sport is another subject close to his heart. “I’m really keen on people receiving individual recognition for their own development. An inspirational Olympian launches the programme, sharing their journey and what it takes to succeed. Young people are asked to review the attributes of successful achievers and the speakers’ success map – before starting their own. Skills developed include visualisation, coaching/mentoring, alignment of mind, body, emotion, values and spirit and teamwork.